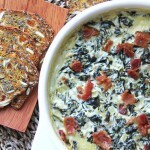 This Baked Goat Cheese & Bacon Spinach Dip is the ultimate hot dip! It’s creamy, rich and full of delicious cheesy bacon flavour! First chop the fresh spinach, dice the onion, and mince the garlic. Then in a skillet, saute the spinach, onion and garlic in a little bit of olive oil, or use about 2 tsp of the bacon grease from your cooked bacon. Salt & pepper to taste. Stir in the goat cheese, sour cream, chopped artichoke and bacon. Add the mixture to an oven proof dish and bake for 25 – 30 minutes or until the mixture is bubbling.